The business card has been around a long time. Before technology and the surge of the digital world, it was a key way to share information with clients, customers, and colleagues. Even today, when we do have access to email and websites with the click of a button, the trusty business card still gets wheeled out time and time again at meetings, conferences, and everything in between. Sure, you might just think the business card is just a piece of business stationary, but it’s actually so much more than that. It’s often the first time a potential client will have contact with your business, so your business card needs to stand out and convey the right information. In fact, 72% of people actively judge a company based on the quality of its business cards, while a further 39% would choose to not do business with a company if they had less-than-stellar business cards. But designing individual business cards for each and every member of your team can be time-consuming and frustrating. A business card can often be the difference between leaving a memorable first impression and losing business, which is why it’s so important to get the design and messaging right. But this can be difficult when you have an entire company to cater for, with different departments, teams, and goals. Buying wholesale is an option a lot of companies jump to for anything they need, whether it’s stationary, hardware, or furniture - and it’s no different for business cards. The perks you get from purchasing wholesale are the same across the board. Not only is it cheaper - because bulk-buying goods usually gets you a discount - it’s also easier for companies with multiple departments, because it means you can get hundreds more business cards printed at a cheaper rate for every member of staff. Buying wholesale means you can leave out the stress, time, and headaches that designing individual cards for every member of your time can lead to. Remember, business cards can be your most important marketing tool. It’s hard to believe in this day and age with access to the digital world just a swipe away, but having a physical thing to hand to prospects can mean the difference between you standing out and being lost in a crowd of competitors. Now you know why wholesale business cards help save you money and wasted time, let’s take a look at what goes into designing and ordering them. 1. What’s Going On Your Card? Like with any business card, you need to decide what you want your wholesale business cards to look like. This is a two-pronged approach that takes in the design of your card (so essentially its aesthetic appearance) and the information you want to have on it. Making your business card look nice is the most exciting part of the ordering process. At this point, you get to decide every visual element that’s squeezed onto your card so that it’s eye-catching and leaves a lasting impression. But other than that, you can go crazy with what your card looks like. You might decide to have an full image splashed across one side and all the text on the other. You might choose to have your logo front and center on the card, or you might choose to have it in a more conspicuous place so that the other information stands out more. Feel free to get really creative here, too. If your business has a fun vibe, you might want to go for bold colors or quirky illustrations, whereas if you want to give a more serious, professional impression, you might choose high-quality photographs or a simple black and white design. Once you’ve got the images sorted and are happy with the colors and design, it’s time to get that all-important information down. This is where you have room to play around with wholesale business cards, because you can swap out different information depending on the department or team you’re designing the cards for. Again, it depends on the purpose of your business cards. Your sales team business cards might focus more on contact details, whereas the marketing department might want to emphasize their social media handles more. 2. What Impression Do You Want Your Business Cards to Send Out? Once you’ve determined what information your teams need on their cards and have played around with where your logo will go and other visual elements, it’s time to really consider what your business cards say about your brand. You probably have fonts that are aligned to your brand and that’s a good thing. You want prospects to recognize your branding, as this is one of the key ways you’ll stand out. If the colors and fonts on your business card are inconsistent with the ones on your website (which a prospect will inevitably visit once they’ve got their hands on your card), it’s going to be confusing and could potentially lose you their business. So choose your fonts wisely. If you don’t have branded fonts or you want to get a little creative, consider how you want clients to feel about your brand when they look at your business card. For example, if you’re an attorney and you have childish, handwritten fonts all over your business cards, your clients probably aren’t going to take you as seriously as if you had a solid sans-serif font. The great thing about business cards is they’re so tactile. In the digital age, being able to physically touch something and feel it in your hands immediately makes more of an impact than seeing some information written down on a website. You can make the most of all the human senses by choosing a paper quality that matches your brand or that makes a lasting impression. Firstly, you can choose the thickness of your card. The thicker options might be more expensive, but they give a totally different feel to thinner, flimsier cards. 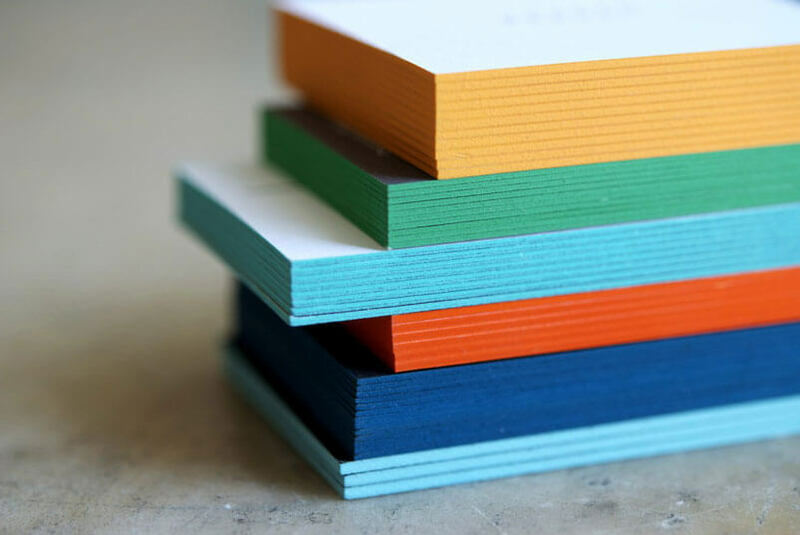 Most business cards are printed on either 14-point cardstock, a thicker 16-point cardstock, or a thin 100 lb. gloss cover. It’s not just the thickness you need to think about here, either; there’s also the choice to switch up the finish of the card. Matte and gloss are the two most popular choices, but you can also choose to have a varnish finish or emboss the text to make it a little fancier. Again, consider the message you want to send out about your brand with your business cards and use that to guide what cardstock and finish you go for. So you’ve got the design, text, and finish down, but I bet you didn’t think about the shape of your business cards, did you? Yes, most cards are the standard rectangular shape, but that doesn’t mean yours have to be as well. In fact, you can get really creative here to make your cards stand out in a stack. You might decide to go for a circular option or you might decide to go all out and have a weird and wonderful cut-out shape. Whatever you decide to go for, make sure it’s in keeping with your brand and the impression you want to give out to clients and customers. If departments in your company regularly go to conferences, hold client meetings, and generally network in the industry, chances are you’ll need some business cards for them to hand out. For fast-growing businesses and companies with multiple different departments, this can be a costly expense that often takes a backseat. But, as one of your most vital in-person marketing tools, having business cards can mean the difference between making a great first impression and not making one at all. To cut down on the costs of getting business cards printed for all your departments, you can go wholesale. When bought in bulk, the price of business cards dramatically drops, making it a more affordable and easier option. And, if you’re concerned about keeping your cards consistent throughout the company, Brandly can help you out. When you upload a design to the dashboard, you can save it and keep it on file so you can come back and tweak the text on it for different departments later down the line. This not only makes the process so much quicker (because you don’t have to design the cards from scratch every time), but it also means other members of staff can login and print their own business cards to save unnecessary wasted time. If you’re ready to make business cards that stand out, sign up for our newsletter. We’ll send you tips and tricks on business card design and more.